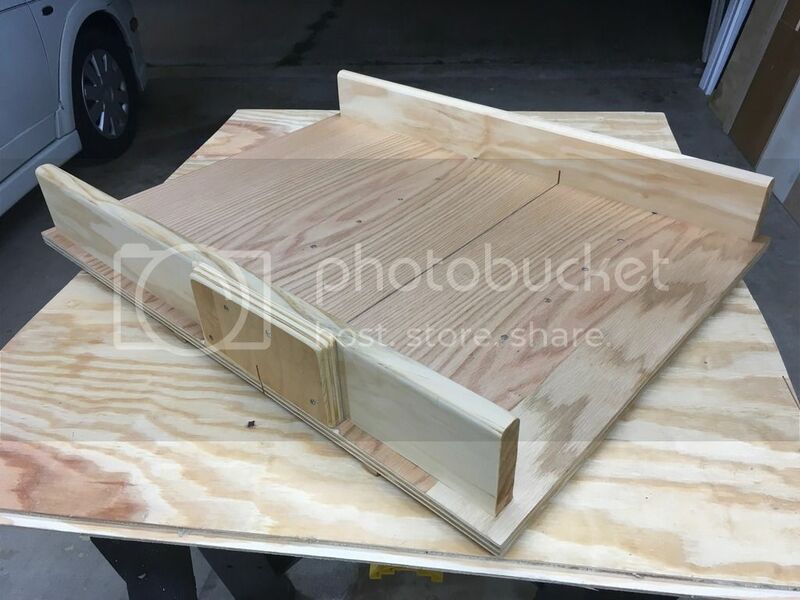 I had fun and learned a lot while making my first cross-cut sled. When I used the 5th cut method I came up with an error of ( .177 ). After moving the fence I performed another 5th cut method and came up with an error of ( .008 )! I guess I can live with an error that small. A valuable addition to your saw, well worth the time invested in making as accurate as you can. Two suggestions, I would coat the entire unit with some sort of finish, 2. more of a safety block on the end where the blade comes through. Paint that red as a visual reminder to keep clear. This is my main sled. The block at the back keeps my thumbs out of the way. Stick with a stable material for the base. I like MDF, but others prefer plywood. Either works. And, I don’t finish the top surface. I want that friction to keep the work in place. I do wax the bottom though, so it slides easily. That is very good for a first try. I have a clue of sleds. I built a big one and only use it once in awhile. I have a smaller sled about 18” long that I use a lot. I also glued some 220 sand paper on it on the back piece to keep things from moving. My sled is finished with shellac. Im surprised more people don’t design a sled with an adjustable back. I have built a few sleds, and it seems no matter how accurate that thing is when its done, over time it always get a little out out of square… my guess is from taking it on and off the table, torquing even the slightest, etc. I will post some pics of my newest sled, I borrowed the design from someone else, but its pretty darn cool. But nice first sled indeed, you will be so happy when you need to square of ends and do a bunch of repeat same sized cuts! Good, accurately built sleds are worth their weigh in gold . They will make you a better woodworker. 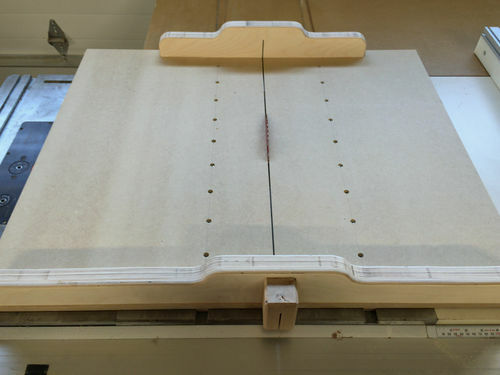 I have built a number of special purpose sleds and a couple of standard crosscut sleds and they make repetitive cuts easier and more accurate. Keep up the good work. Good Luck, Have Fun and Work Safely! I made a very similar sled about a month and a half ago, and am very happy with how it came out and how it works. I chose to keep mine simple, because A) As noted, when/if it gets out of square, I won’t feel badly having to scrap it, and B) By keeping the end boards square, I can use simple blocks clamped in place for stops and hold downs if needed. Left mine untreated as well, but waxed the heck out of the bottom and the maple runners. Great looking sled! You will really enjoy the benefits of your work on this piece.